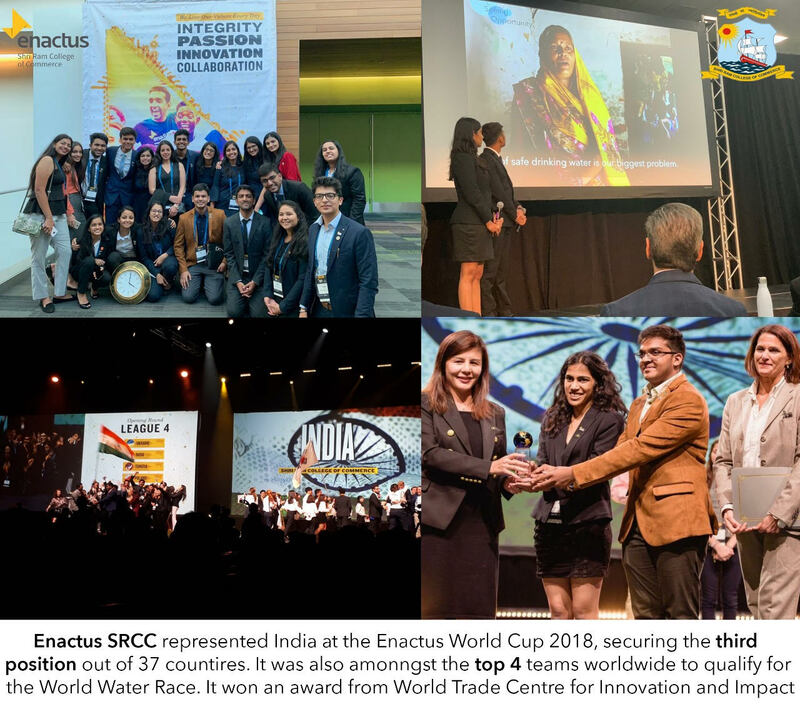 Enactus is an international not for profit organization present in 1,700 Universities across 36 Countries and has over 70,500 students as active members. It brings together students from universities across the world to take up social outreach projects for the benefit of underprivileged communities. It identifies communities in need and devises alternative business models for them, with the ultimate aim of empowering community members and transforming them into entrepreneurs. Eventually, Enactus members step out of the project after creating a self-sustaining business model for the communities so that they do not have to rely on any external party. Enactus was started at Shri Ram College of Commerce in the academic year 2007-2008. Since then, 11 projects have been taken up – 8 of which have been successfully completed while 3 are still continuing. The three ongoing projects are- Project Azmat : Repossessing Respect; Project Kayakalp : Pulling the Strings of Change; and Project Sattva : Churning Purity into Progress. Project Azmat aims at the rehabilitation of manual scavengers by providing them with an alternate sustainable livelihood. It works with a community of 18 women in the village of Nekpur, Ghaziabad. The community has been trained in manufacturing of cleaning products and they now earn their livelihood through its sales. Project Kayakalp is an endeavor to revive the art of puppertry and aims to empower 14 traditional puppeteers from the Kathputli Colony of Shadipur in Delhi. Kayakalp seeks to modernize their art form and use the medium of puppetry to convey social and environmental messages. Project Sattva is based in Karnal (Haryana) and aims to tackle the inefficiencies in the distribution network of milk and milk related products. Enactus has associated with NDRI Karnal and Arpana Services, an NGO, to achieve its objectives. Enactus Shri Ram College of Commerce is a student-run not for profit organisation that undertakes social entrepreneurship projects in order to move towards a better, more sustainable world. Since its inception in 2007, the organisation has successfully completed 11 projects, and is currently running 4 projects in various sectors. Through Project Asbah-Every Drop a Promise, an initiative in the water sector, Enactus SRCC aims to provide affordable and clean drinking water to rural areas across the country. As a part of this project, Enactus SRCC identified Lalbagh, the largest slum in the capital with over 2 lac residents which face problems of overcrowding around Government water tankers, exploitative water mafias and dysfunctional municipal lines. A majority of the population consumes ground water, which is chemically contaminated due to which they suffer from various water-borne diseases. In addition to this, most of them do not have the purchasing power to buy filtered water on a daily basis. After conducting comprehensive water tests and surveys, Enactus SRCC decided to set up a Community RO plant in Azadpur, the only possible solution to combat the heavy chemical contamination in the area. A Community RO is the most effective water purification technology available in the market today capable of clearing all contaminants in water regardless of their size, density and type. An RO Plant is established in a common place like parks, open spaces public centres in the community so as to provide access to multiple families at any point of time. For this, the organisation received support from the Delhi Jal Board and Model Town MLA Mr. Akhilesh Pati Tripathi. They also collaborated with CSRs of various corporates as well as 20 schools across different cities in the country. This Community RO plant was successfully inaugurated on 20th April by the Health Minister of Delhi, Mr. Satyendra Jain, Model Town MLA, Mr. Akhilesh Pati Tripathi, and graced by several other respectable persons, including the Principal, Dr. Simrit Kaur and other professors from SRCC. For this initiative, the student-run organisation was also appreciated by the Chief Minister of Delhi, Mr. Arvind Kejriwal. The MLA, Mr.Akhilesh Pati Tripathi, has also decided to further support Enactus SRCC in expanding its project by offering land for the plant in more rural villages around Delhi where there is a need for RO water. In September 2018, another Community RO Plant has been set up in an urban slum, Kabir Nagar. Both these 1000 LpH plants will be able to provide highly affordable RO water on a daily basis to 1000 families. It works on a card-based system, through which these families will be able to receive 20 litres of clean drinking water everyday. The RO plant will be entirely run and handled by the residents of the urban slums itself, hereby creating employment and empowering the people there. Furthermore, the four walls surrounding the plant have been beautified as a step taken to spread awareness of the importance of clean drinking water among the rural people. Enactus SRCC hopes that these Community ROs are only the beginning of its vision to set up many such plants in regions where there is a dire need for it, and thus move towards towards its goal of creating a world where every person has easy access to potable drinking water. Project Kayakalp aims to empower traditional puppeteers of Kathputli colony, New Delhi and expand their income generation possibilities, while also using the medium of puppetry to convey social and environmental messages. Puppetry, in India has seen a downward gradient from being an art which lit up the Indian streets and courtrooms, to being pushed to hopeless anonymity reduced by the contemporary forms of entertainment. Project Kayakalp is an initiative to revive the dying art form. The project has grown by leaps and bounds this year. We have been able to tap a variety of unexplored demand avenues from the Barclays Social Impact Forum, Election Commission of India, Delhi metro Rail Corporation shows for PVR YES Bank and Max India Foundation to telecasts on Doordarshan. In 2015, the puppeteers scaled up to perform in Haryana, Uttar Pradesh, Nagaland, Madhya Pradesh and Maharashtra. Additionally, stalls for the sale of puppetry merchandise were put up to augment the artists' income. Stalls were set up at Durga Puja Pandals, Diwali melas, college festivals, as well as at the embassy of Bhutan. Recently, the artists from Project Kayakalp conducted a puppetry workshop at the Centre for Cultural Resources and Training - CCRT, New Delhi for 120 teachers from 19 states. The workshop took puppetry beyond the confines of being a mode of entertainment and propagated its use as an effective mode of education and spreading awareness. The puppeteers were also made to attend third party meetings to give them a practical experience of conversing with and convincing people. Kayakalp has been registered under the India Trust Act. The puppeteers are being taught the art of script writing. Personality Development sessions are now a regular feature of Kayakalp. These sessions aim at improving the puppeteers' communication, language and presentation skills. They focus on enabling them to contact different organisations themselves and secure contracts. Training under the Teach India programme of Times of India enabled our puppeteers to speak English confidently and fluently. Project Kayakalp has been covered extensively this year; finding several mentions in Times of India as well as screen time on NDTV 24x7. The Income of puppeteers has risen to over 7 times their previous incomes. The revinal of the traditional art form of puppetry is a step towards preserving the cultural heritage of India. This shows aim to spread awareness on issued of critical importance. The marketing material like poster and brochures are made of eco-friendly material. The workshops teach students to make puppets from old newspapers and waste material. This shows spread important environmental messages. Project Kayakalp has now turned into a successful enterprise. Project Azmat is an endeavour to liberate the Manual Scavengers by providing them a sustainable source of livelihood through development of a micro-enterprise and to facilitate construction of proper toilet systems. 'Azmat', meaning dignity in Urdu, uses a multi-faceted approach for the rehabilitation of manual scavengers - by providing them an alternative source of livelihood and replacement of dry latrines with proper toilets. The dry latrines are demolished and two pit toilets are constructed for the entire village. These toilets require no maintenance costs, require little water and convert waste into manure. Enactus SRCC has collaborated with Sulabh International Social ServiceOrganization for the purpose of construction of 128 two-pit toilets to ensure that the women do not go back to that profession. Prime goal of Project Azmat is the rehabilitation of our target group of women ,from the village Nekpur in Uttar Pradesh, by organizing them into a cooperative society and providing them basic literacy and financial training and training in detergent making to make them proficient to practice an alternative livelihood. The business model will generate enough revenue to increase their income by 575%. Besides detergent, phenyl and other cleaning products are being exploded as an option. Several hospitals in Noida have come on board for using the phenyl & the cleaning products produced by the women in their premises. The new employment opportunity has increased the overall income of the women, thereby empowering them and making them financially self-reliant. This has also inculcated in them the habit of savings which will ensure long term prosperity. The villagers were employed in the construction of the two-pit toilets in the village and the raw materials were procured locally. This not only served as an employment opportunity but also boosted the rural economy. Project Azmat has created a threefold impact. Project Azmat directly impacts the 18 women who are currently involved in producing detergent. They are no longer practicing manual scavenging. Earlier they used to earn Rs 10 per day in kind. Now, their incomes have increased substantially. The lives of former manual scavengers, who are not involved in producing detergent, have also seen a remarkable change in lifestyles. Gender bias and inequality are other major issues addressed under this project. In the initial phase of the project, a total of 128 two pit toilets were constructed in the village. Open defecation is no more an issue amongst the villagers and they are sensitive towards issues of cleanliness and sanitation. The two pit toilets conserve water and convert human waste into nutrient rich manure, which creates a positive environmental impact and also promotes the agrarian economy of the village. With Project Azmat we successfully create 18 women entrepreneurs, effectively empower 90 people of the community, and improve health and sanitation conditions for 8000 people of the village. Our vision is to successfully empower these women and at a later stage expand to more such communities in need. The project was initiated in April 2015 with the aim is to empower rural women in Karnal and enable value addition to milk at the grass-root level. Despite the abundance of milk production in India, lack of knowledge on proper rearing practices by dairy farmers, inefficiencies in the distribution network for milk and milk products, and absence of adequate milk processing facilities at the village level have led to severe exploitation of dairy farmers, which in turn, has led to consumption of low quality products. Through this endeavour, we have facilitated access to microfinance and scientific training to women dairy farmers for rearing of high yielding cattle and promote women-run milk collection and processing units to provide unadulterated milk and milk products to consumers. Project Sattva has already engaged 25 women directly and benefitted 920 people indirectly through improved quality of products. The revenue of the processor groups have increased by Rs. 1,77,750 marking a 17% increase in the income per woman to Rs. 9,639 in the three months of operation. Empower the women to gain ownership of their business, increasing the female labour force participation rate and transforming their role from mere supporters of their husbands to rightful bread earners of their households. Moreover, the supply of fresh, unadulterated milk will improve nourishment in the region. Training in scientific cattle rearing along with efficient feed management, manure management and product processing has led to water conservation and reduced overgrazing.. Also, cattle dung will be converted into manure, vermin-compost and bio pesticides and fertilizers, thus directly helping in improved farming practices in the village. Project Sattva promises immense potential for growth. The model is highly replicable and we seek to bring many more villages under the ambit of the project. Project Life on Wheels facilitates micro credit for rickshaw pullers plying in Delhi University, North Campus to enable them to purchase their own rickshaws, rather than hire them from exploitative contractors. Rickshaw-pulling, a low-skill and zero investment profession, is a lucrative option for most illiterate migrants. But the real scenario is much more sinister than this glossy description. The rickshaws are hired from exploitative contractors at exorbitant rates, diminishing their already limited income. They also lack access to healthcare, education, collateral and social security. Caught in a vicious trap, the rickshaw pullers can never hope to own a rickshaw. The 85 Rickshaw Pullers impacted under Life On Wheels are now proud owners of their ‘own’ rickshaws, their self-respect being restored. They have benefitted by augmentation of income and stimulation of greater savings. Also, the space behind the rickshaw for advertisements provides additional revenue. The overall impact being of Rs. 32,40,000. The rickshaw pullers have also benefitted from the financial and literacy training, family health camps and distribution of educational kits to their children; hence, their quality of life has improved significantly. The custom made Enactus rickshaws have an extended shed that covers the passenger as well as the rickshaw-puller and a waste basket that helps promote a cleaner campus. Further, rickshaws are an environment friendly mode of transport.